Guppy tropical fish for beginners | Care Guide And Tips. Guppy tropical fish can be fairly easy to care for, making them a great starter fish for your new aquarium. These fish are very small, colorful, and hardy. They can be quite curious and active for such a docile little fish. Guppies are one of the best choices for beginners, and especially for children. They usually start out as the lowest priced fish in any shop and go up according to the variant you purchase. Guppy fish swim almost effortlessly within your tank, but they can get diseases just like any other fish. Guppies need a community at least at least inhabitants, so a good size tank is needed. Never put them in a tank less than 5-gallons, and preferably not under a 10-gallon tank. In suggest a 20-gallon tank with lots of 'safe' friends. However, if you want to have only one fish, a 5-gallon fish tank will work. Never use a fish bowl with a guppy, if they do not live long with a good tank. Guppies can have a range of pH levels between 7.0 and 8.5, and quite warm temperatures around 82-84 ° F ((23-24 ° C).) These two facts exemplify their hardiness. Guppies like a highly vegetated tank. They love to hide in it, raise their baby guppies. It also imitates their natural environment. Guppies like large plants like the Echinodorus amazonus , the Cabomba, and Vallisneria spiralis . Guppies are easy to use as long as it's a high quality brand. They like flake food, or Spirulina as daily consumption. Guppies also like spinach, lettuce, freeze dried fruits, bloodworms, and larvae (most mosquito). A guppy has a very small stomach so can eat only so much at a feeding. I would recommend feeding them small amounts they can consume in 2-3 minutes, and three times a day. Guppies a very social and need a community. Raising them in a community tank with other peaceful fish is good. 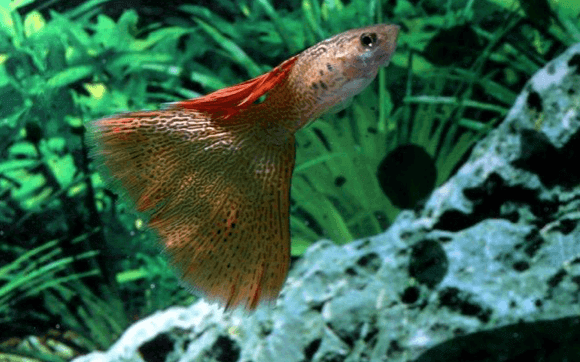 However, as guppies are known to be nippers, other long tail fish could suffer injury or harm. Just like the bully at school, if you stand your ground and fight back if necessary, they will leave you alone. 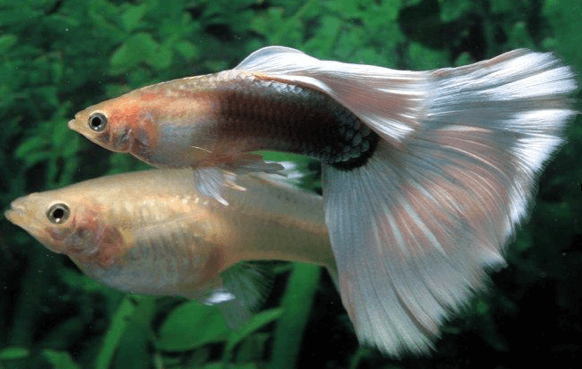 If you are looking for a pickup on a Betta, Goldfish, any other that stands up for himself, the Guppy fish will leave them alone. Guppies can suffer injury and diseases just as any other fish. To avoid them have good water quality, keeping plants and tank clean is most important. Keep down the stress levels, which also goes for any fish. If your fish is stressed out, their immunity drops just like ours does. Watch for injuries on your Guppy fish. If they are unhappy, attacking others, fin nipping, they may be getting injured in reciprocating attacks. Is my Guppy a Male or Female? Females are much rounder and larger than males. They look like different species, where they are dull gray with colorful yet wider fins. Guppies are like rabbits, the bred often! They can out-breed a tank quickly! They are livebearers, meaning as long as a male and female are together in a tank, they will wide almost non-stop. If you see a male spreading his fins are curling around the female, they are displaying their courtship. Once the female is fertilized, she will give birth to about 28 to 30 days. Her stomach grows quickly until she resembles a box, not a fish. She will go to the bottom to rest on plants and the substrate, and lose her appetite and stop eating. Once she has given birth, the fry are left to fend for themselves and they are a floating delicacy even to their own species. They need lots of hiding places like floating plants. Try Pistia strratiotes or Lemna minor. It is suggested to have a separate tank for guppy fry until they are larger. If you are into Guppy breeding you could be quite successful with the right knowledge and aquarium setup. Here is the ratio breakdown for you. For two months, producing twenty newborns for five months, and two hundred Guppies for sale. There are many other factors involved when breeding any fish species. We have a great guppies breeding book with lots of comparisons, places to keep your notes, your business expenses and more.